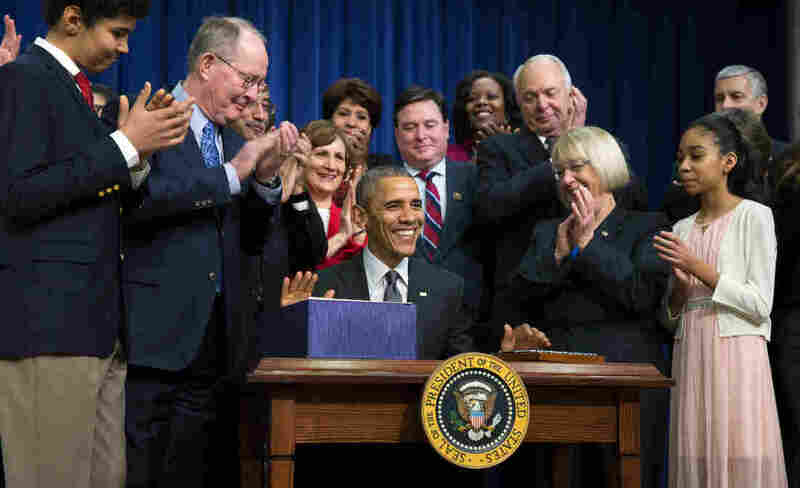 President Obama Signs Education Law, Leaving 'No Child' Behind : The Two-Way The new law, known as the Every Student Succeeds Act, changes much about the federal government's role in education, largely by scaling back Washington's influence. President Obama smiles Thursday after signing the Every Student Succeeds Act, a major education law setting U.S. public schools on a new course of accountability. The new law changes much about the federal government's role in education, largely by scaling back Washington's influence. While ESSA keeps in place the basic testing requirements of No Child Left Behind, it strips away many of the high stakes that had been attached to student scores. "It often forced schools and school districts into cookie-cutter reforms that didn't always produce the kinds of results that we wanted to see," Obama said. NCLB was signed by President George W. Bush in early 2002 and was, itself, an update of a much older law — the Elementary and Secondary Education Act of 1965. While ESSA officially marks the end of the NCLB era, the majority of states have for several years received waivers from the Obama administration, exempting them from some of the law's toughest requirements.